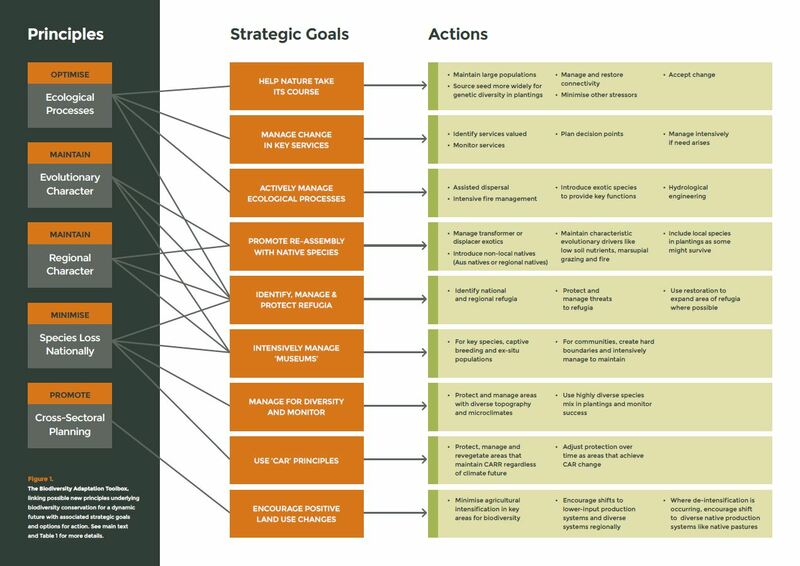 New or revised strategic goals and actions will be needed to align with new principles for managing biodiversity under climate change. To help, we present ‘The Biodiversity Adaptation Toolbox’ (click on the image to view a larger version, and explore the links to the right for further detail). We first suggest a range of potential strategic goals that could be established to support the new principles introduced, and support these with a suite of optional actions to achieve these goals. These options are intended to stimulate new thinking and provide starting points that could be used in planning now. We hope that biodiversity planners and managers can draw on, add to, and adjust this Toolbox and thus contribute to the ongoing discussion of principles, goals and actions that will best manage biodiversity into the future. Click on the right hand side menu to learn more about the strategic goals and actions to achieve practical implementation.